At Captain Hogg’s Charter Service, we pride ourselves in the quality of the Virginia striped bass that we catch. In the lower Chesapeake Bay, we run most of our striper fishing charters to the famous Chesapeake Bay Bridge Tunnel. The CBBT is one of the best artificial reefs on the east coast and Virginia striped bass use the CBBT as “home base” all year long. The striped bass that we see migrate through the lower Chesapeake Bay and Atlantic Ocean. These striped bass range in size from ten to seventy pounds. Many Virginia state records for striped bass have come from these prime fishing waters. As the water in the bay cools off, the striper fishing heats up! The newly built Smokin’ Gun II has a fully enclosed heated cabin which will keep you toasty and warm while enjoying yourself on one of our striped bass charters. Our striped bass charters are usually action packed, so bring your friends and experience a great day striper fishing on the Chesapeake Bay. 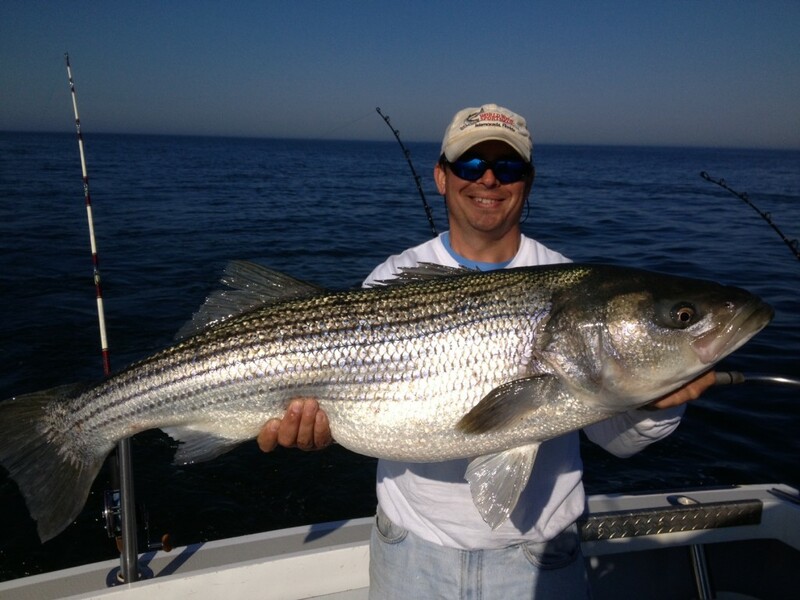 Striped bass fishing season runs from October 4th until March 31st and then from May 1st to June 15th. During the coastal striped bass season, we move the Smokin’ Gun II closer to the action and dock at Rudee Inlet in Virginia Beach, VA. With runs to the striper fishing grounds only taking a few minutes, we provide our striper fishing charters first crack at giant ocean striped bass! The trophy striper fishing out of Virginia Beach is some of the best fishing in the world so contact us today and come load your coolers with trophy striped bass with Captain Hogg’s Charter Service. To contact Captain Hogg about a striped bass fishing charter, either complete our brief contact form or call (757) 876-1590.